Remember spoilers ahead! Don't read unless you're a spoiler addict like me! After rewatching Timeranger (with TV-Nihon subs and in better quality before Shout! inevitably licenses it) I thought about how time travel could affect various continuities in Super Sentai. 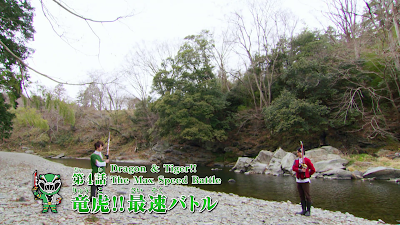 Just take note that Toei tends to use the multiverse format when they write Super Sentai. A lot of events here would include crossover movies (which may be referred to as the VS. Universe) which manage to change the way things go. 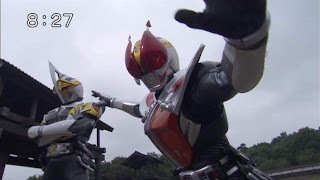 It's time to ride the Den-Liner or Time Gamma (take your pick) to see how time travel could affect various continuities in Toei's entries of Tokusatsu series. I may be missing some so feel free to write down what's missing. Time travel was done in Denziman (though I haven't seen that episode), Maskman, Liveman (though it was someone from the future getting dragged into the past and a dinosaur was dragged into the present), Jetman, Abaranger, Magiranger, Goseiger, Timeranger (which the crossover with GoGoFive also had it), Go-Busters vs. Gokaiger, Kyoryuger vs. Go-Busters, the ToQGer Returns Movie (which past and future versions of the ToQGers team up) and Ninninger. I guess we're going to see a time travel anytime soon in Kyuranger. 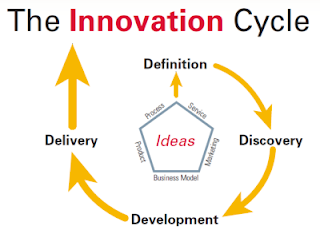 So what consequences could happen as a result of it? Here's a few episodes or instances that my mind could remember. This entry is subject to a lot of editing since I may have missed a lot of stuff here. Maskman's time travel episode (episode 38) is probably one funny episode in an otherwise serious show. I can't forget the reaction everyone had when they discovered Takeru was lying through his teeth about his past. Prince/Princess Igam requested Emperor Zeba to use Time Doggler so she could delete Takeru in the past. We know the consequence of that. This managed to change history a bit since it was Takeru in the present that changed Takeru in the past. How Takeru in the past managed to become a better person prior to this incident remains unknown. However, everyone seemed to forgot it happened since it was not brought up again. I guess the Maskmen decided to focus on the present Takeru who reformed from the bad child he was in the past. Jetman episode 26 "I'm a Primitive"presents another possible impact time travel could have with history. While it doesn't address what if Raita decided to stay in the stone age or whether or not it could delete him from history but it does show one expected event. Raita taught the primitives a thing or two and even had a near romance with who could be Kaori's ancestor or just her doppelganger. The end of the episode showed that Raita ended up getting deified as a god by the cavemen in some magazine. Hmmm... way to leave a mark in history huh? The year 3000 made the most advanced time travel technology which could alter the flow of time itself or events that happen. The series did focus on that on some issues like how the supreme douchebag Captain Ryuuya himself was pulling the strings. Early on the series the Timerangers weren't even allowed to return to the Year 3000 because the Londarz has escaped. So what's going on? It's a huge fight against fate one way or another. I thought about Dolnero's escape to the year 2000. What planet Dolnero came from wasn't know but hasn't he considered he could be deleting his own existence? The Timerangers are also requested not to kill but to simply bring back the prisoners. I guess death penalty was abolished and replaced with the much more painful cryogenic freeze compress or maybe killing them in the past could affect the future. Don Dolnero's death at the hands of Gien caused Yuuri's family to still live. Gien's death in the past could have also changed the year 3001 though these changes aren't even being shown. My own WTF analysis should go to Captain Ryuuya. Watching this show made me thankful Masato Kusaka in Kamen Rider Faiz didn't have access to time travel. Captain Ryuuya saw the possibility of two futures. One was where Gien gets wiped out by G-Zord and their era ceases to exist. The other is where the Great Disappearance happens but the 30th century won't change much. Captain Ryuuya wanted to cheat death without otherwise changing the 30th century for the worse. I thought about it did he even consider that his own actions that he could get deleted from existence if Tatsuya dies or is there some kind of reset button that he also foresaw? I thought about the Great Disappearance phenomenon which part of the the 21st century would be destroyed. Why was Captain Ryuuya allowing it to happen? Did he foresee other events that were deleted from the script? 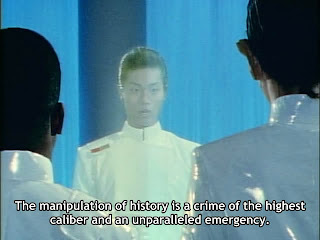 My only speculation is that if Gien were destroyed in the Great Disappearance then maybe we'll get Kamen Rider Ryuki's executive meddling induced reset button ending. Maybe, Tatsuya would have survived, Naoto would have died and maybe none of the events of Timeranger would have happened. It could have ended up like Spielban's last minute ending for everyone. Then again we know Yasuko Kobayashi tends to like being tragic at time. Fortunately, she started having lighter tones post-Ryuki like Shinkenger, Kamen Rider OOO and ToQGer while she was writing the dark spin-off series Amazons. Kamen Rider Den-O can be one confusing season because of all the time travel that happens. The hero Ryota Nogami is a loser and suddenly he becomes a hero. The plot involves a future ravaged by Imagins and only a hero of the present can save them. A hero from the present must team up with people from the future to prevent a dystopian figure from happening. What should be very funny is that Ryota meets an adult version of his niece Hana (the daughter of his sister Airi and Sakurai). Events start to show stuff like the arrival of the mainv villain Kai into their present time. The finale manages to save the future though Ryotaro is back to being a loser. Talk about confusion when you meet your niece who's now as old as you are. In some fictional cases your son or daughter from the future may return in time old enough to be your parent. Den-O, All Riders: Let's Go Kamen Riders" leaving a Core Medal in the past allowed Shocker to become Shocker Greed as a result of it. The events resulted to a lot of crazy stuff such as one person from the future remained in the past and fathered a child back in the 70s. Talk about screwed up since the child who got stranded in the past returned as an adult. So how did that affect the timeline? Somehow, audiences are left to decide. 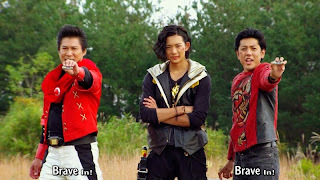 Episodes 12 to 13 of Abaranger showed the Abarangers getting flung back in history. The consequence of this action was that as long as the Abarangers remain in the past the Evolien would also disappear. This isn't explained why it's like that. The Evolien not wanting to be destroyed ended up sending back the Abarangers to the present. Why sending the Abarangers into the past ended up nearly deleting the Evolien is left unexplained. My only theory is that sending the Abarangers into the past may have disrupted the flow of time that would have allowed the Evolien to exist in the first place. 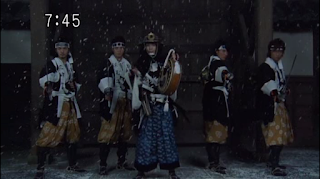 The Gekirangers were sent back to feudal Japan in Lesson 33. They were to reclaim the Virtuous Beast King Sword. This was also to prevent a mess-up of the events that really happened on January 30, 1703 where Kira Yoshinaka was killed by the 47 Ronin. If anything should happen outside history then Japan's history would be forever altered. Well this was one mess of a movie IMO due to the fact they had to insert Abaranger and Zyuranger when the dinosaur trilogy are very different from each other. It was a cool what-if scenario for some though I would have preferred if the other two series weren't brought in to avoid cramming in too much space. I still thought that the plot where the Kyoryugers are brainwashed into killing dinosaurs in the past. 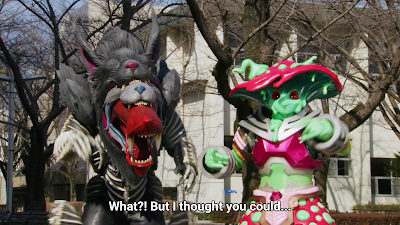 The consequence is that they could have destroyed the Zyuden Beasts in the process. I guess we can be thankful that time travel may never be a reality. As much as I want to travel in time but it seems to have more risks than rewards involved. These incidents show that how time travel can be a double-edged sword which could help make a better future or a worse one. But I guess the only thing I could do right now is live in the present and live for the future.